Yesterday you read about (and maybe understood) the new Java 8 language features coming with the Android N Developer Preview. One of the prerequisites of using these improvements is the latest version of Android Studio. The IDE was briefly mentioned in that article, but we thought it deserved a little more attention for both the improvements and some of the caveats to updating right now. 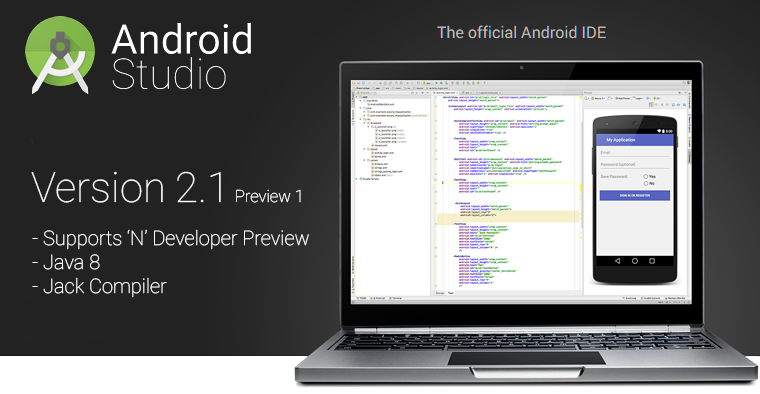 The Android Studio 2.1 Preview 1 is based on the current 2.0 version in the beta channel. The changelog is basically a roadmap to supporting the new features promised with Android N: support for Java 8, improved support for the Jack compiler, and an updated New Project wizard to generate projects targeting the Android N Preview. The tools team also notes that improvements have been made for supporting the new, faster Android Emulator, which of course also runs Android N Preview system images. Be aware that there are some consequences to jumping on board with the v2.1 Preview at this point. To begin with, Instant Run doesn't work with the Jack compiler yet. Since Jack is only really required if you're using the Java 8 language features, most of which only work with Android N, it's pretty clear that developers will only have to sacrifice Instant Run if they are targeting Android N or insist on using lambda expressions. The Jack compiler is also not compatible with tools that read .class files, which again, the tradeoff is obvious. There's also a big limitation for NDK developers: the LLDB debugger doesn't work with the Android N Preview yet. As always, if you're planning to try the bleeding edge of Android Studio, it's wise to also keep a stable version handy in the event that something is broken. If you're ready to update to Android Studio 2.1 Preview 1, just change your update settings to pull from the canary channel and check for the latest.